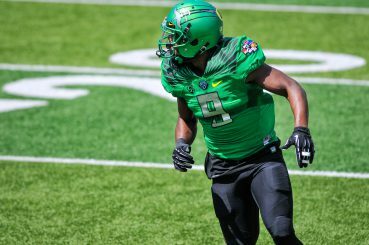 Charles Nelson is a perfect picture of what Oregon football represents. Athleticism, strong work ethic and above all a willingness and ability to stretch himself. The sophomore exploded on to the scene as a rookie, showcasing his physical capabilities as he caught 23 passes for five touchdowns, averaging 14.2 yards per catch. Charles Nelson isn’t looking to slow down in 2015. Nelson has spent the offseason training with the defense, stepping into the shoes of departed veterans Ifo Ekpre-Olomu and Troy Hill. This year’s spring game was essentially a showcase for the wide receiver/cornerback when he caught two touchdowns of 40+ yards and had an interception while playing both ways. He has been so outstanding that coaches are still tussling over where he will play in 2015. Byron Marshall is the prime example flexibility leading to success. All he has done is convert from the team’s leading rusher into the team’s leading receiver over the last two seasons without missing a beat. Marshall carried the Ducks rushing attack in 2013 as he led the team in carries (168) –over 50 times more than Thomas Tyer— , yards (1,038), and rushing touchdowns (14). 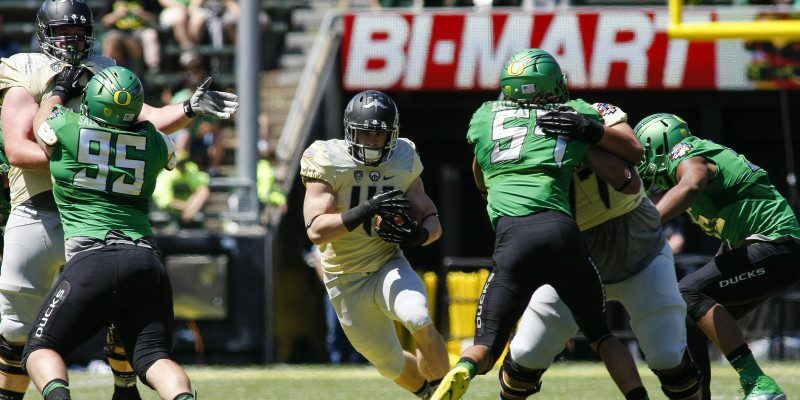 Byron Marshall has led the Ducks rushing and receiving attacks in the last two years. Enter Royce Freeman and Marshall was forced to move into the slot where he proved to be just as dangerous. 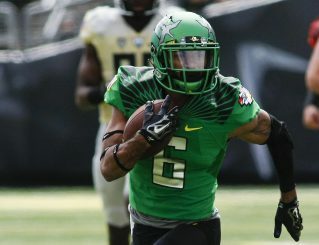 His skills as a receiver quickly made him an asset as he became Marcus Mariota‘s favorite target, catching 74 passes (almost twice as many as second place Dwayne Stanford) for 1,003 yards and six touchdowns, becoming the only player in the last 10 years to lead the Ducks in both receiving and rushing yards. Cameron Hunt brings experience to a young offensive line. Numerous injuries to the offensive line last year were mitigated by the fact that head coach Mark Helfrich could move players around. Tyrell Crosby moved back and forth between right and left tackle and Cameron Hunt rotated between right guard and tackle throughout the season. Without the veteran leadership of Hroniss Grasu, Jake Fisher and Hamani Stevens that flexibility will be more important than ever. With the dynamic skills of Nelson, Marshall and the offensive line well known in Duck circles, there is another name that is going to join that list. Matt Hegarty is a fifth year transfer student from Notre Dame and will likely take over Grasu’s vacated position at center. The 6′ 5″ 295 lb lineman brings experience to a questionable offensive line. 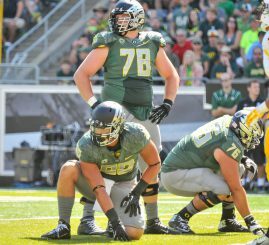 According to Keith Arnold, Hegarty decided to join the Ducks for his final year of eligibility so that he could play center for a competitive program. He had been relegated to playing guard and competing for playing time at Notre Dame but his abilities have been accepted with open arms in Eugene. Hegarty appears to be a perfect match for Oregon’s system as he already has experience playing multiple positions on the line. The four-star recruit out of high school did not see any action as a freshman suffered a mini stroke in 2012 and got his first start in 2013. That year the Fighting Irish offensive line put up spectacular numbers, allowing only eight sacks on 429 pass attempts. With a number of questions still in play for the Ducks — chiefly, who will be the starting quarterback– these kinds of dynamic players are crucial for the continued success of the Ducks. With fall camp right around the corner, those questions will soon be answered and we will see how the new-look Oregon offense can fare in the dangerous Pac-12.